There is a full bathroom on each level of the cabin (3). Stainless steel appliances, granite counter tops, wrap around deck, gated community, close to Boone, Blowing Rock, Tweetsie Railroad, shopping, fishing, etc. The basic supplies provided for the first day are toilet paper, paper towels, and hand soap. * You may find residual items, like aluminum foil, dishwasher soap, etc., as this is a family oriented home. We rented this home for 5 nights as it is near Boone where we were getting our two kids off to college at App State. The home was very clean and tastefully decorated. We did have a few disappointments. The first was when we sat down to watch TV after a long day and there were no batteries in the remotes. The second was the fireplace didn't work. We were told they shut them off until October. It was rather chilly so a fire would have been nice. There was no mention in the description that the fireplace wouldn't be available. The good news is we did take advantage of the outdoor Fire pit, however we still missed the inside fireplace. Finally, the beds were very uncomfortable. After the first night we went out and purchased a Memory Foam mattress top and it was great the rest of the week. The owners may want to think about putting new bedding and matress pads on all the beds. It was also disappointing to learn we had to drive 10 minutes to drop off our garbage. Even if you pay the cleaning fee you can't leave more than 2 bags of garbage. Rather odd that guests have to do this and they don't have someone pick it up. Regardless of our few disappointments, the home is very nice and the hot tub was clean and ready to go. We felt the price was a very good value and we would come back again. The location was great as it is 10 miles from Boone and not far from West Jefferson (cute little town). The Blue Ridge parkway is very close so you can skip over to Blowing Rock (30 min nice drive). We have since replaced the queen size mattress with very comfortable pillow top mattresses. We've not received a single complaint about them since! We keep extra batteries (AA, AAA, & 9 volt) and light bulbs in the cabinet above the microwave. My family and some friends, a total party of 6 adults and 5 children stayed at the cabin this past Christmas and it was heaven! We almost didn't want to leave the cabin to go anywhere. We cooked so many meals there and enjoyed the cabin very much! Very spacious, clean, and the kids love the stairs. It's a pitty that we didn't get to use the hot tub since we were busy cooking all the time-:) The rate was very reasonable and I will definitly consider renting it again in the near future! 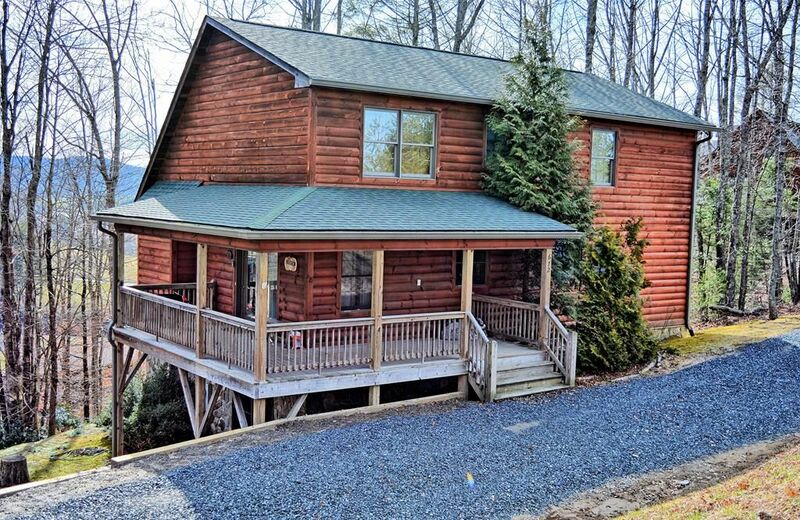 This great cabin is 15-20 minutes east of Boone and close to ASU, Blowing Rock, Tweetsie Railroad, West Jefferson, Grandfather Mountain, and so, so much more. Sorry, but this cabin is not pet friendly. Golf: Golfing Nearby: Boone Golf Club 433 Fairway Drive Just Off US Hwy 321 - Blowing Rock Road Boone, North Carolina Jefferson Landing Hwy 16/88 Jefferson, NC 28640 Jefferson Landing, a gated community is home to an outstanding 4.5 star rated golf course located in the majestic Blue Ridge Mountains. Lodging and fine dining at our exceptional clubhouse is also available. ******************** Mountain Aire Golf Club 1104 Golf Course Road West Jefferson, NC 28694 Enjoy a round of true mountain golf! This course features spectacular views and a friendly atmosphere with reasonable rates. Call or visit our website for tee times and information on real estate opportunities. Ski: There are several ski areas located nearby. Appalachian Ski slope is used by the locals. It is a smaller, family run resort. Consequently, it is especially great for families with smaller children to learn to ski.